A Diné (Navajo) of the Dibé izhiní clan on his mother’s side, Tom is Dakota Bdewakantonwan Hunka from Minnesota. His ceremonial Dakota name is Mato Awanyankapi (The Bears Look Over Him). A Sundance ceremonial leader, he is the Executive Director of the Indigenous Environmental Network, working for the rights of Indigenous Peoples, rights of Mother Earth and for environmental and economic justice. Tom has networked with Indigenous Peoples and spiritual/religious leaders globally helping humanity to re-evaluate their relationship to the sacredness of Grandmother — Mother Earth. 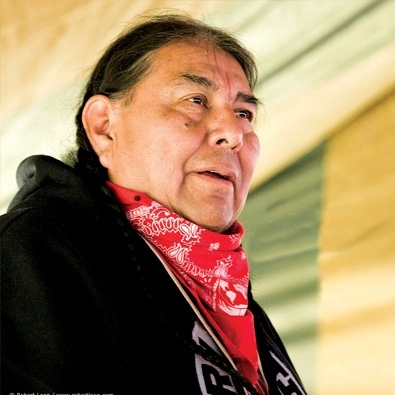 As Executive Director of the Indigenous Environmental Network, Tom Goldtooth has built an organization of 250 indigenous communities focused on climate justice, energy, toxics, water, globalization and trade, and sustainable development. A prominent spokesman on environmental justice issues, he was honored in 2010 by the Sierra Club and the NAACP as a “Green Hero of Color.” He co-produced an award winning documentary film, Drumbeat For Mother Earth, which details the effects of bio-accumulative chemicals on indigenous communities.